There are certain points in the year I like to reflect on just how far Leo has come. 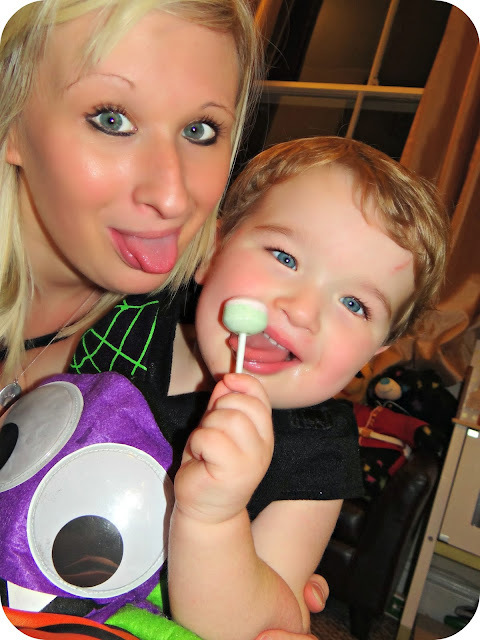 On how much he has changed and grown in those months that have come and gone, and Halloween is one of those points for me. 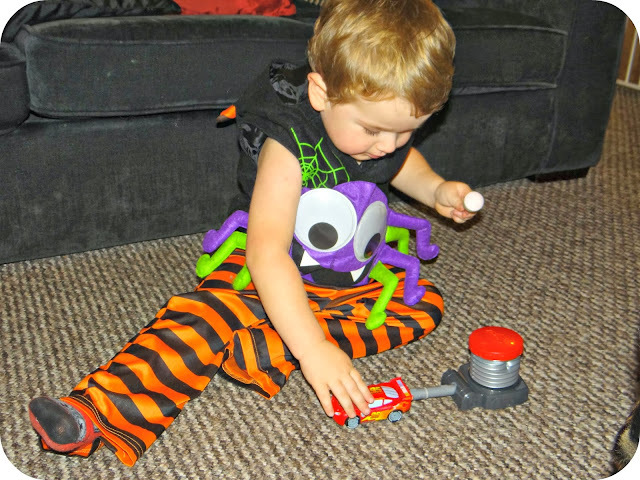 It is a day that I have enjoyed with Leo since the get go, and although those past Halloweens are nothing to him, for me it is a day of fun and highlights just how much he has changed since those very first Halloween days. Halloween 2013 fell when Leo was 28 months old, and although he still doesn't understand why everyone dresses up in spooky costumes and carve pumpkins... He is old enough to take part and enjoy the day like the best of us. We spent the day with Leo's cousin and took a stroll around the local shops. When we came back Leo decided that he did not wish to wear his Halloween costume and avoided putting it on at all costs. 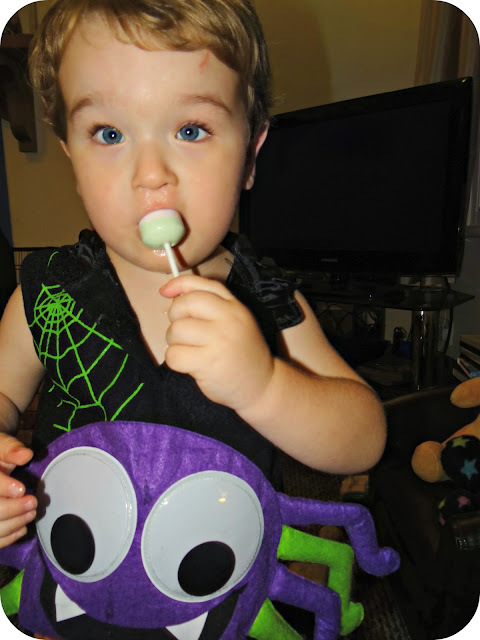 Thankfully a lolly bribe persuaded him into his spider suit, if only for a little while. Leo helped me scoop out the Pumpkin and watched intently as a carved a spooky face into the flesh. We set a candle in the centre and popped it out on the front doorstep so that kid's would know that we were 'trick or treat friendly'. It wasn't long before the door started knocking. It knocked while I was in the middle of getting Leo ready for bed, and it knocked some more while I was putting him to bed. Now if it had been your average door knocking then I wouldn't really have given it a second thought, but parent's were letting their children knock persistently until I opened the door. Then when I greeted them and handed out the goodies, hands were grabbing trying to take everything that they could. The whole trick or treat experience was not really what I had expected. 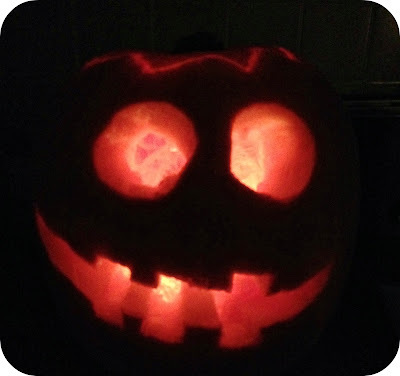 In the end I took the pumpkin down as I didn't wish to encourage anymore grabby children, and I turned out all of the lights and took refuge in the fact that my lounge is at the back of the house. This being the first Halloween where I have actually ever come across kid's trick or treating, I didn't really know what to expect. Where my parent's live it is set back from the road and up a private drive... So kid's never really made the effort to go up there. What Halloween 2013 made me think about was manners and how there really didn't seem to be any at play. I can remember as a child trick or treating... I enjoyed it. But if someone didn't answer my refined knock, I took it as a hint that they didn't want children knocking on their door and moved on. Children today seem to think it is acceptable to knock loud and hard until someone comes to the door. I am definitely more educated on the trick and treating front now. And if Leo ever does express a wish to go trick or treating, he will be doing so with manners and respect. He will say please and thank you in all of the right places, and he will NOT persistently bang on people's front doors. Did you all have a happy All Hallows Eve? 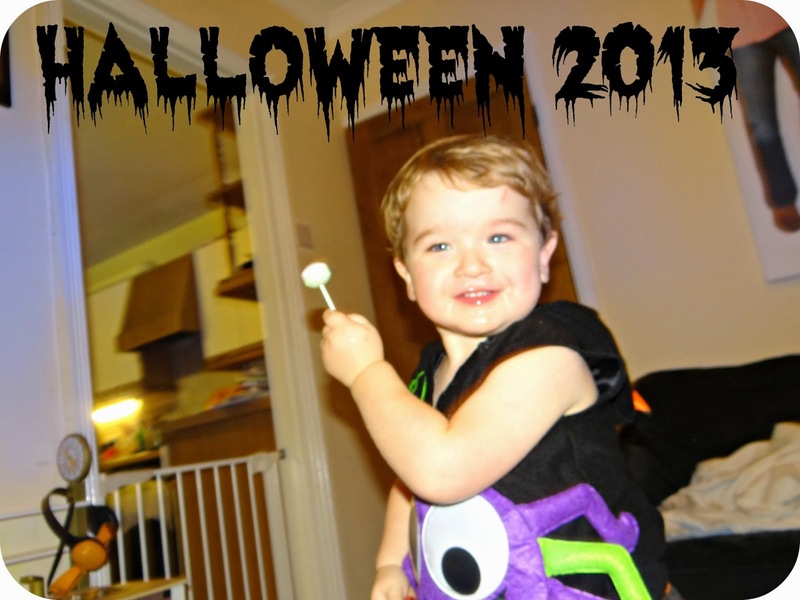 And most importantly did your little one's have a great time?